The National Hockey League is not the only place you can find good-quality, competitive hockey in the Lower Mainland, but it is the game that could empty your wallet. Pitre is not wrong in believing heâ€™s saving lots of money by choosing Giants games over those of their professional counterparts. For the price of one regular-season game ticket to GM Place to watch the Canucks â€“ about $130 â€“ you get this: two tickets to a Giants game at the Pacific Coliseum, parking, two beer, two hotdogs, one Giants team Tshirt, one Giants hat, plus $7 and change back in your pocket. There are three junior hockey leagues in B.C. : the WHL, the British Columbia Hockey League (BCHL), and the Pacific International Junior Hockey League (PIJHL). The most local and community-based of these is the PIJHL, which has its entire conference of teams located within the Lower Mainland and Fraser Valley. For a long time the PIJHL was considered a league riddled with violence, fights and little skill, but all thatâ€™s changing. Play quality in all of B.C.â€™s junior leagues is high. Players are routinely drafted by NHL teams when they turn 18. The good thing for fans of junior teams is that itâ€™s not impossible to get tickets. Unlike Canuck games, for which single-seat tickets are pretty much all thatâ€™s available for good games, junior games have plenty of good tickets available for walk-up customers on game days. The Giants average just under 10,000 fans a game in the Coliseum, which seats 16,281. 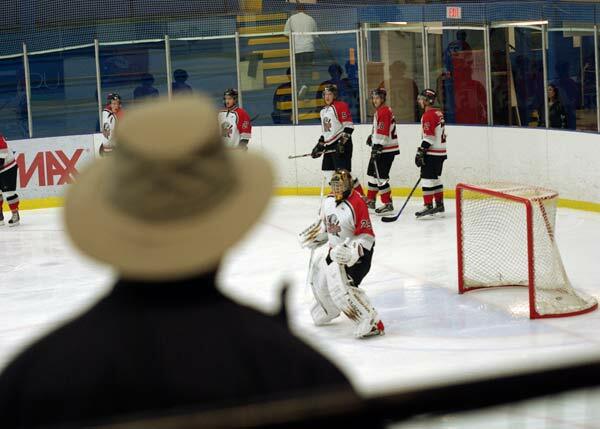 The Sockeyes play in a much smaller venue at Minoru Arenas, which seats about 1,100. This season, they have averaged about 400 fans a game. Minoru Arenas is a first-come-first-seat facility, so all tickets are general admission. The Canucks have sold all 18,630 tickets to the Garage for every game since Nov. 14, 2002. Lower-level junior hockey clubs appeal to a sense of community and families, according to Morimoto. Supporting local programs such as Thomas Cook Elementary School breakfast program, which supplies a hot breakfast to kids who otherwise wouldnâ€™t be able to afford one, and raising money for a local firefighter who was injured on the job, leaving him a quadriplegic, are examples of how the Sockeyes have become involved with the community. The Sockeyes support such charities by donating a portion of ticket sales. Tickets to the Sockeyes games are only $8 for adults and free for any kid wearing a minor-hockey jersey. For roughly the same price as one ticket to a Canuck game plus parking, a father and son could get a season-ticket package and attend all 25 home games of the team of their choice in the PIJHL.